Or else their theories sink. Teach Brown is blue and ice. They had been choked with soot. Through the land of mist and snow. So what does everyone think of the Sputnik Plain? Polygons abound. Looks more like cellular features to me though. Pluto's "massive tail of charged plasma"
we’ve just learned that Pluto’s atmosphere is pouring away into space. It’s leaving a massive tail of charged plasma in its wake. Why did you emphasise it? We've seen comets and planets with tails of plasma, and now we can add another one. So far, so good EU! "We have actually flown through this [tail]," Fran Bagenal, a New Horizons co-investigator from the University of Colorado, Boulder, said during the press conference. Ionized gas forms when a bunch of energy pummels atmospheric atoms and molecules. This bombardment pops electrons off the atmospheric gas particles, allowing their electrons to freely circulate. The end result is plasma: a fourth state of matter after solids, liquids, and gases. As far as we know, plasma is the most common state of matter in the universe. There's simply a lot of energy pouring out of stars, and a lot of gas floating in space to form plasma. So, while it might seem surprising, plasma tails like Pluto's aren't new. They even exist behind other planets in the Solar System, including Venus and Mars. 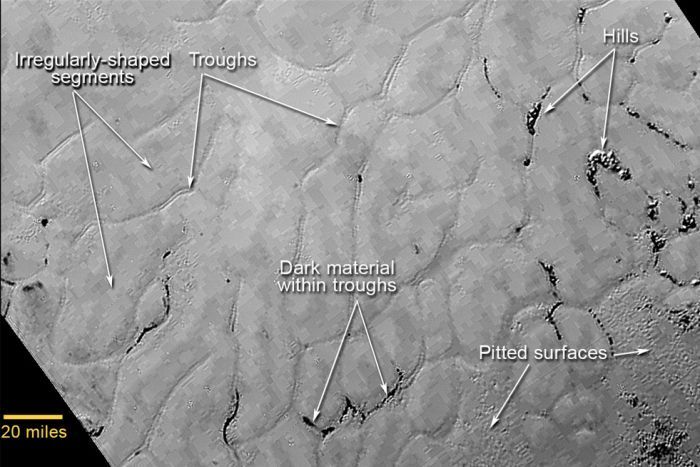 Pluto data reveals terrain that is “not easy to explain"
Re: Pluto data reveals terrain that is “not easy to explain"
The appropriate term to apply there would be "assume" or "surmise". 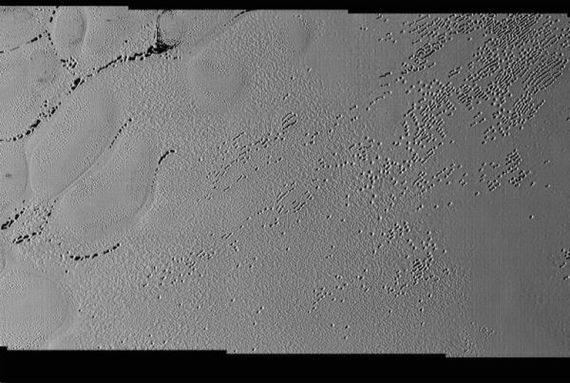 "This terrain is not easy to explain"
and "exceeds all pre-fly expectations"
The backlighting highlights over a dozen layers of haze in Pluto’s tenuous but distended atmosphere. The image was taken from a distance of 11,000 miles (18,000 kilometers) to Pluto; the scene is 780 miles (1,250 kilometers) wide. Owing to its favorable backlighting and high resolution, this MVIC image also reveals new details of hazes throughout Pluto’s tenuous but extended nitrogen atmosphere. The image shows more than a dozen thin haze layers extending from near the ground to at least 60 miles (100 kilometers) above the surface. In addition, the image reveals at least one bank of fog-like, low-lying haze illuminated by the setting sun against Pluto’s dark side, raked by shadows from nearby mountains. Ice that appears to be made of frozen nitrogen accumulates on the uplands on the right side of this 390-mile-wide image. 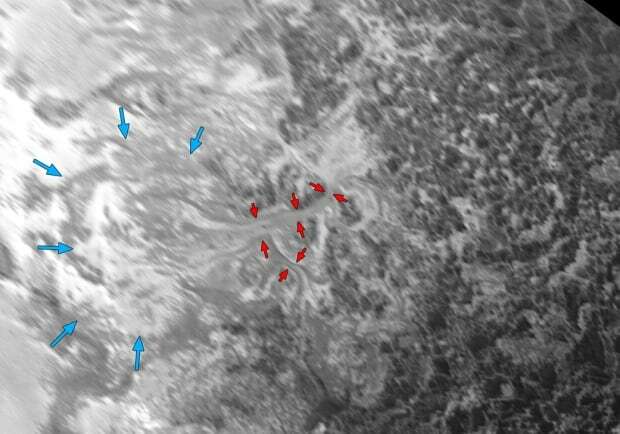 It is draining from Pluto's mountains onto the "heart." According to the press release, NASA scientists did not expect to find a nitrogen-based weather cycle on the dwarf planet. 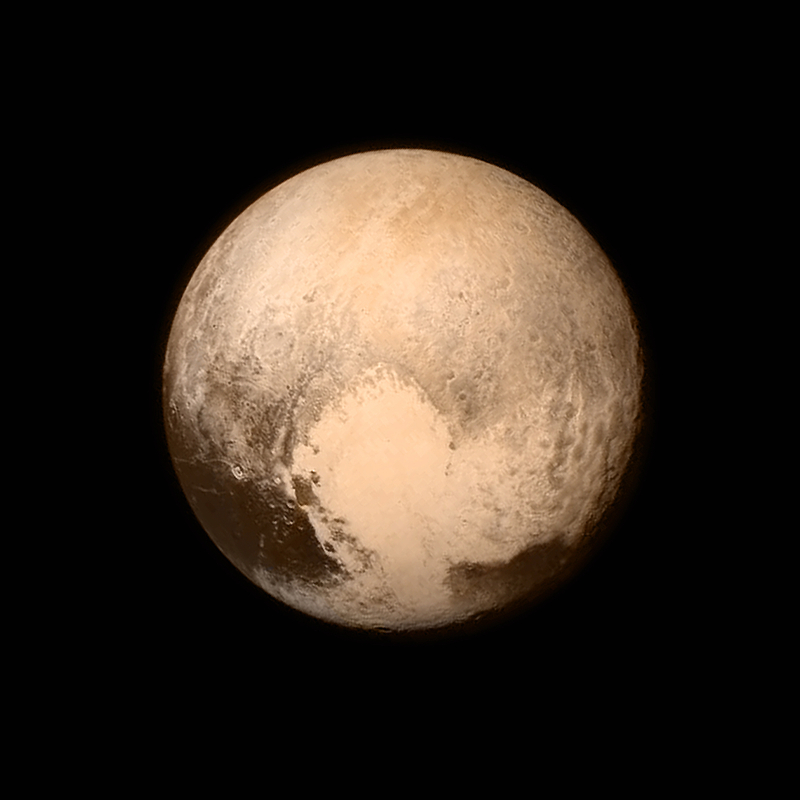 "Pluto is surprisingly Earth-like in this regard," Stern said in the press release, "and no one predicted it." I have not found information on the mechanical properties of frozen nitrogen, can it flow at such low temperatures? How hard is it? 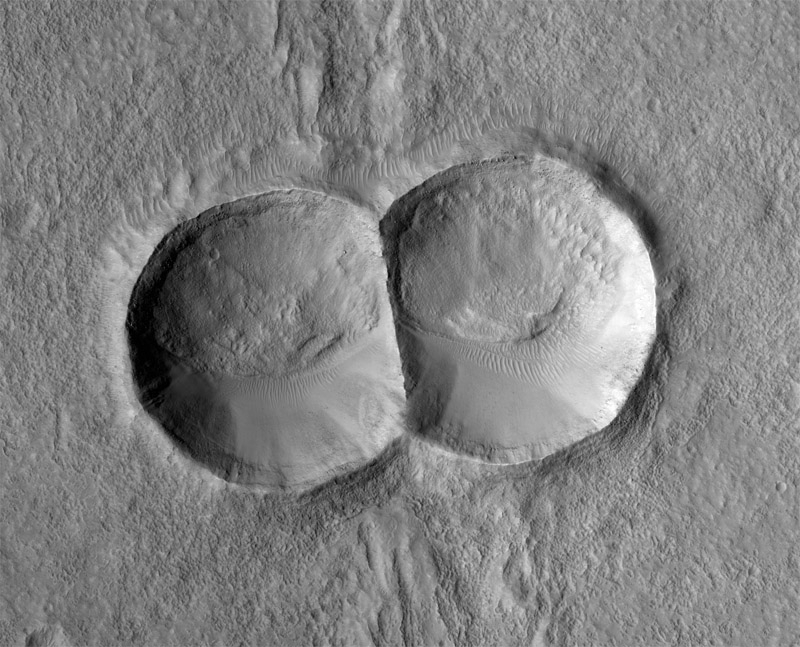 Anyway, this looks like a case of ice having filled in the electrically formed crater and plasma cut channels. Something about Pluto that appeared to not be predicted. Looks expectable for a planetary surface in an electric Universe to me. It would be puzzling if the Universe was not electric. I have a question about this image. How is there enough radiation from the sun to illuminate Pluto. This image looks as bright as our moon. I expect there is some enhancement of the image but to me, something is off here. I admit to no technical skills that would tell me there is something amiss with this photo but in my mind Pluto is so far away from the sun that it not have a light and dark side as there would not be enough solar radiation to create such an effect.